It's an aerial dance familiar to residents of many large cities as television news helicopters share the sky, jockeying to position their cameras for live shots of fires, car chases and other breaking news events. The TV station pilots take care to coordinate their actions and avoid each other, experts and industry officials say, but two of the aircraft got too close while covering a Phoenix police chase, colliding and killing four people. Though two collisions involving news helicopters in Japan in 1984 and 1994 killed a total of six people, the president of the Radio-Television News Directors Association said she could not recall another U.S. incident of two news choppers colliding while covering a story. "These pilots, they are very professional," Barbara Cochran said from Washington. "They combine the skills of pilots and skills as journalists." "The one thing you don't compromise is safety to be competitive," said Kevin McCutchen, a past president of the National Broadcast Pilots Association and a television news pilot for 11 years in Indianapolis. On Friday, five news helicopters and one police helicopter were in the air following a truck that police were pursuing through Phoenix. Some witnesses said one of the TV helicopters appeared to be hovering when a second one turned into it. "They just got sucked into each other, and they both exploded and pieces were flying everywhere," said Rick Gotchie, an air conditioning contractor who was working nearby. They plummeted from an altitude of about 500 feet into a grassy park in the middle of the city and burst into flames. 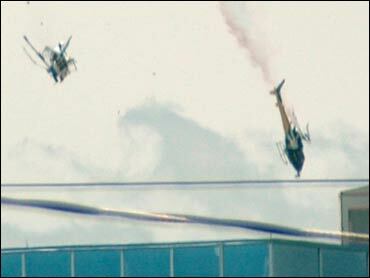 All four people aboard the KNXV-TV and KTVK-TV helicopters — one pilot and one photographer on each — were killed. No one on the ground was injured, although a piece of one helicopter's rotor blade hit a truck windshield. Federal investigators will spend several days examining the scene and the helicopters' maintenance records, and will look at whether the pilots followed federal regulations, National Transportation Safety Board member Steve R. Chealander said Saturday. "Aviation accidents are very complex and we have to look into every aspect of it, and it is never quite what it seems," said Chealander. The Federal Aviation Administration has not had any major safety problems with news chopper operations, said regional spokesman Ian Gregor in Los Angeles. But aviation attorney Justin Green tells CBS News that as the skies grow more crowded they're growing more dangerous. "When you have no rules — there are no rules about the minimum distance between helicopters . . . you're going to have accidents like this," Green says. Gregor said the pilots of the several helicopters over the Phoenix chase, about 5 miles northwest of the city's airport, were not talking to air traffic controllers. Pilots generally use a dedicated radio frequency to talk to each other, he said. There is a high degree of coordination among the pilots, Gregor said. "To fly for a TV station you have to have a commercial rating, which means more (flight hours), more training." McCutchen said pilot awareness is vital while covering news events because of the many distractions that could spell trouble. "You are watching the scene. You have to bring your attention inside to look at the monitors to see what the audience is seeing so you can converse," McCutchen said. "But you're also having to direct your attention to the other aircraft flying around you. You have to have your head on a swivel in those kinds of situations." In McCutchen's market, pilots of news choppers pick different altitudes and radio their positions to the other pilots. "So then we have vertical separation, and then we make sure we have horizontal separation. But we're talking to each other. I may be live on the air and one of the other guys may say `Hey, I'm coming up on your left side.' I'll break away from what I'm doing on the air and say `Roger,' and then go back to talking." Along with radio communication, the aircrafts' flashing beacon lights and conspicuous paint schemes also help alert pilots to the proximity of the other helicopters, a helicopter safety consultant and pilot trainer said. "It's a pretty intense operation, as you can imagine, and where you've got competition among television stations, they obviously need to make sure it is a friendly competition," said consultant Shawn Coyle of Southampton, Pa. "If something goes wrong, the communication broke down somewhere along the way."